The Centre is seeking a qualified student for the role of Creativity & Craft Day Camp Coordinator to implement a series of craft and art programs for children this summer. The Creativity & Craft Day Camp Coordinator will direct the program, lead activities and anticipate program needs. Cape Breton Centre for Craft & Design is offering an eight-week position for a Gallery Assistant. The successful candidate will work in the Centre’s beautiful Gallery Shop in the Sydney Waterfront District and will be responsible in assisting the Gallery Manager in the day-to-day operation of the Gallery. The passion and dedication that underlies the creation of craft can also be found in the offices of Cape Breton Centre for Craft & Design. Here, a small but mighty team with a diverse range of skills, united by a love of Cape Breton craft and a fierce commitment to its preservation and cultivation, implements the Centre’s programs and services on a daily basis. Lori’s work with the Centre began in the winter of 2009 as Marketing Manager where she worked with Centre staff to build the profile of the organization and the Cape Breton craft sector. Now as Executive Director, Lori plans to continue to make Cape Breton Centre for Craft & Design and the Cape Breton craft sector globally known. After 3+ years of experimenting with a variety of craft courses and workshops, Lori has accepted that she is a “collector” rather than a maker…which is probably better for the creative economy anyway! Diane joined the staff of the Cape Breton Centre for Craft & Design back in 1989 when it was still known as the Cape Breton School of Crafts. Her job has evolved greatly over the years and as a long time employee, her duties are varied and include committee work, financial responsibilities, organizing courses and workshops and supporting other staff in the day to day operation of the Centre. It is often said that Diane is the glue that holds all the different departments of the Centre together. Working in a not for profit organization has its challenges, but the biggest pleasure Diane gets from her job is the daily interaction with the many people who visit the Centre. The members, the volunteers and the other staff make coming to work every day a pleasure. Their dedication and commitment to the organization is inspiring. When the 9 to 5 day is through, Diane can most often be found weaving at her loom. However, as an aspiring knitter, occasionally she can be found mumbling and fumbling with a pair of knitting needles and a ball of yarn. Writer, copywriter, researcher, government “agent”, administrator, marketing assistant, instructor… through the many twists and turns of Holley’s career, her passion for the arts has been constant. She was involved in the formation of artsCape Breton: Council of Arts & Culture, participated in numerous studies and symposiums involving the Island’s culture sector and wrote and produced the Centre’s newsletter for many years. Over the years, she has taken classes at the Centre in several media discovering that it’s all harder than it looks and reinforcing her belief that Cape Breton artists produce some of the finest quality work in the world. She finds it a thrill and a delight to be part of the dedicated team at Cape Breton Centre for Craft & Design working with more than 80 of the best craft producers in Cape Breton, surrounded by and representing their extraordinary work. Elizabeth joined the team at Cape Breton Centre for Craft & Design in 2013 after completing the Master of Public Relations program at Mount Saint Vincent University. Previous to that, Elizabeth graduated from the Mount with a Bachelor of Public Relations and Certificate in Marketing. Elizabeth appreciates the creativity, dedication, and hard work demonstrated by the artisans that are represented in the Gallery Shop, in addition to the artisan studios around our beautiful island. As Marketing Manager, Elizabeth aims to promote the profile and prominence of the Cape Breton craft industry – not only locally, but also regionally, nationally and internationally. Tammy Sophocleous-MacDonald is the Office Assistant at the Cape Breton Centre for Craft & Design, which means she’s at the heart of the organization. Tammy ensures the smooth running of the office, keeps up to date with our members, runs registration for courses, and supports every element of the Centre. Tammy thinks that when you work with such a great group of staff, it makes coming to work an enjoyable pleasure. It’s such an honour everyday to get to meet all kinds of different and talented people. Tammy likes to take her work home. She spends her out of office hours working on art projects with her daughters who enjoys pottery, drawing, and sewing. Watch for Tammy’s daughters to be future artisans in our Gallery some day. Teena Marie has been a professional artist since the mid 1990s working in relief printmaking as well as painting in acrylics. She has been a volunteer and a member of the Cape Breton Centre for Craft & Design since 1996 serving on the Board of Directors as well as the Product Assessment, Craft Market, Fundraising and Exhibition Committees to assist in the work of the Centre and the growth of the arts and crafts sector on Cape Breton Island. Teena Marie is also a member of the Centre’s staff in the Gallery Shop where she enjoys working to creatively exhibit and promote the work of the Centre’s wonderful artists and artisans. Teena Marie’s own work can be seen on display in the Centre’s Gallery Shop. Máire joined the staff of the Cape Breton Centre for Craft and Design in 2018. Originally from Ireland, her life has been heavily surrounded by arts, crafts, history and culture. With a Ceramicist mother, she grew up understanding the needs and life of an artist. Máire is very aware of the unique art and craft culture within Cape Breton and can truly understand why it is known as the Craft Capital. As the Craft Business Development Manager, she is looking forward to assisting the Cape Breton artists in making their dreams of owning a business a reality, while also helping the established businesses develop even further. In her spare time, she likes to crochet, cook, take photographs and take on projects that challenge and develop her artistic skills. Laura Collinet is the Craft Business Incubator Coordinator who works with artists in residence at the Customs House and at the Centre in Sydney. Her goal is to help artists with the scarier side of owning their own business. 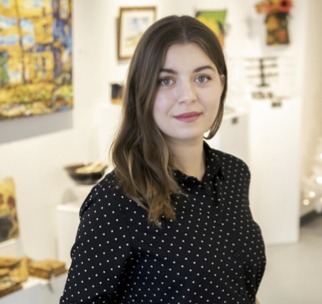 Though Laura went to NSCAD University for textiles, she immediately fell in love the business side of craft and has been working in the start-up and entrepreneurship community ever since. She thrives as the administration for artists. In her spare time, Laura enjoys hiking the Cape Breton trails with her husky and taking pottery courses at the Centre.